Gemma Coles is the founder and coach of Head Over Heels Gymnastics, a Bournemouth based gymnastics club, which operates in a variety of schools and public settings, providing coaching and guidance to young gymnast enthusiasts looking to perfect their techniques. Through sharing her passion for gymnastics, Gemma has made a highly successful career in coaching young talent, both in a class setting and more recently, books and videos. We’re immensely proud to have worked with Gemma, first in 2014 with the production of a DVD and mobile app videos to accompany her first book on Floor Skills. The video proved to be a great success selling both in physical format online and through mobile app downloads on Apple and Android platforms. 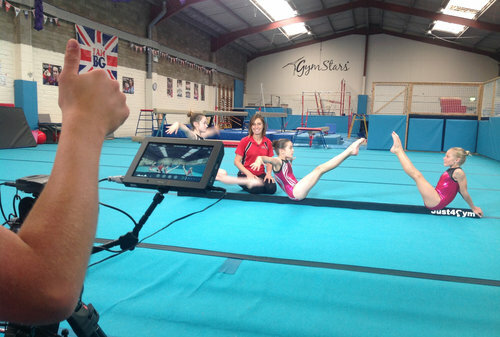 In 2017 we worked with Gemma again to produce a brand new set of videos to go with her Floor Beam skills book. The shoot took place over the course of one day in July at a local gym club, where we captured a total of 42 video sequences, perfectly illustrated and guided by Gemma along with her (very!) talented young gymnasts. All of the videos are divided up in to categories which are navigated using the DVD menu that we designed to match the style of the book as closely as possible. Each video selected features an opening and closing screen and post-it notes which appear on screen to offer additional guidance where required. To add a new dynamic and upbeat tone, we also sourced a background music track for each video. Visit the Head Over Heels website to order your copy, or search ‘Head Over Heels About Gymnastics’ in the Apple and Google Play App Stores.